I have this theory that there are no new ideas, just variations of old ideas. I say this with a grain of salt because clearly my blog is filled with recipes that are 95% percent originals - yet if you looked hard enough, you could find someone, somewhere who created something similar. It's inevitable. This was so true watching a cooking challenge the other night when a competitor was bragging about a potato-topped pizza she created...I ordered a potato pizza at a Lucky Strikes bowling alley over 3 years ago! 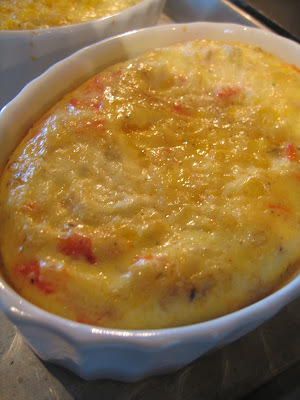 My point is that I'm giving you a recipe that is eerily similar to a quiche; really this could be named Crustless Corn Quiche. 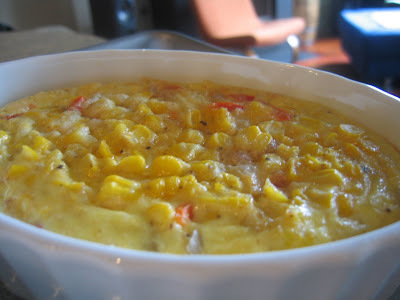 But somehow Corn Custard just seems a little bit sexier! The fun thing with this recipe is you can add to it. A simple handful of chorizo takes this to a whole new level and can provide a heartier dinner; not to mention could pair with a simple wine! Or add a few grill roasted veggies and take this on a picnic! For a real fun flavor, try adding some crumbled blue cheese and caraway seeds- I use this combination with cabbage soup and boy does it work. So call it what you will, it's simple, tasty and versatile. All the traits that keep us fat and happy! Pour the whisked eggs into one (or two smaller) oven-friendly dishes. Add the corn and the onion/peppers. Place the dishes into the oven, bake until the middle is set.